This Friday, Oct. 31, please bring candy that hasn’t been sold and any funds that has been collected to Mr. Day’s room M 226. Come by before school, from 7:30 to 8:15 a.m., during 3rd, 4th, or 7th period, or after school from 3 to 4:15 p.m.
Students will be able to continue selling candy past the Oct. 31 date, but this initial collection time will help pay for the current bill. 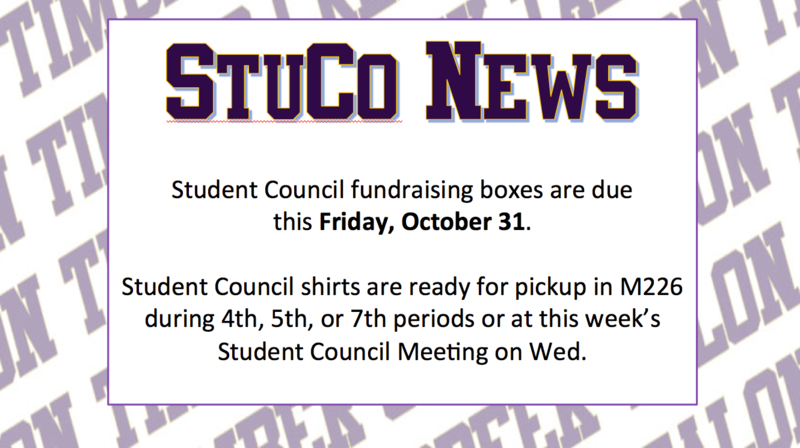 Additionally, Student Council shirts are ready for pickup in M226 during 4th, 5th, or 7th periods or at this week’s meeting.